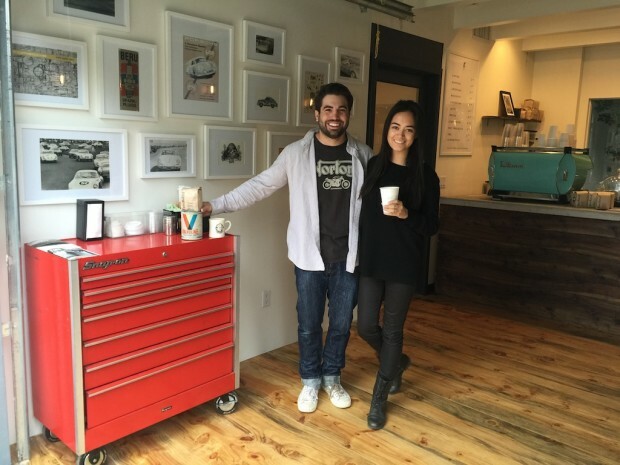 Nico Samaras and Mia Aguillon of Fourtillfour Coffee. All photos courtesy of Fourtillfour. We recently shared news of the December opening of Dapper Coffee Co., a coffee and food establishment located inside the dazzling showroom of Club9, which houses a collection of vintage Porsches and other classy vehicles. That café is in South Africa, but for fans that share the evidently parallel loves of Porsches and fine coffee in the American Southwest, there’s another, more accessible coffee shop newly opened that may carry a similar appeal in the Old Town neighborhood of Scottsdale, Ariz.
Fourtillfour occupies an attractively built-out space of just a couple hundred square feet, attached to a mixed-use facility called the White House at 7105 East First Avenue. With an upward sliding garage door, the Fourtillfour shop is sort of like the garage attached to the house, which is not by accident. 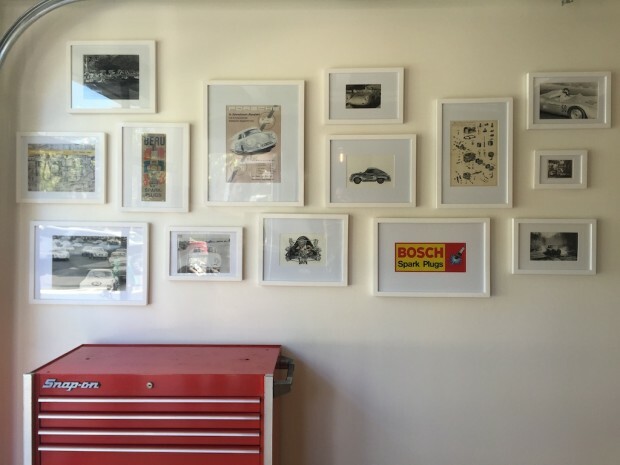 A rolling mechanic’s tool chest stands in as the condiment bar, and the walls are adorned with Porsche and other memorabilia and inspirations, including a photo of the owner’s grandfather in his tool and die shop and two original watercolors by the coincidentally South African artist Claudia Liebenberg. On the first Saturday of every month, Fourtillfour hosts a meet-up for Porsche enthusiasts in the lot behind the building. “We thought only a few cars would show up and we had about 50 air-cooled Porches all around,” reported Samaras. 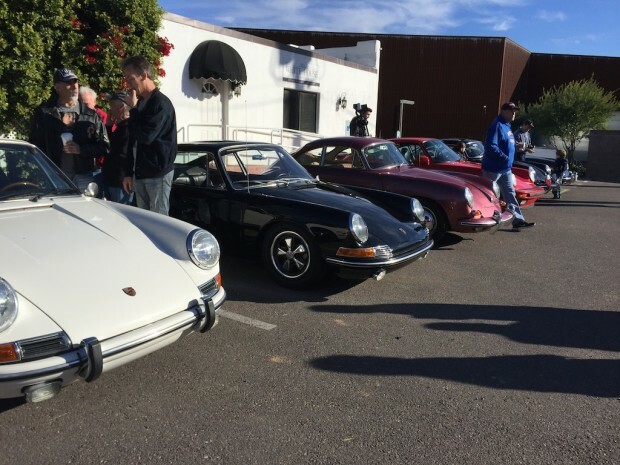 Scottsdale has a robust car culture with its ideal year-round driving weather that’s also great for planning outdoor events. The dry, rust-free conditions are also a boon to owners of classic cars, furthering the popularity of the hobby in the area. The subject of Fourtillfour’s First Saturday meet-ups could vary between other cars or motorcycles going forward, though it’s the Porsche that speaks to Samaras’ heart most directly. His love for the cars started when he was a teenager, when his first Porsche came shipped in pieces and he and his father put it back together. Today Samaras owns two Porches, and over the years about a dozen have passed through his possession. In order to finance the opening of the coffee shop, Samaras sold two that were of his favorite model, the 356. If read as the time of day, that’s four ’til four. Fourtillfour’s coffee is roasted by the Four Barrel Coffee company, based in San Francisco, the city in which Samaras’ and Fourtillfour co-founder Mia Aguillon’s love of coffee first shifted into high gear. Samaras was studying art at University of San Francisco where he met Aguillon, at which time Four Barrel was high among their favorites. 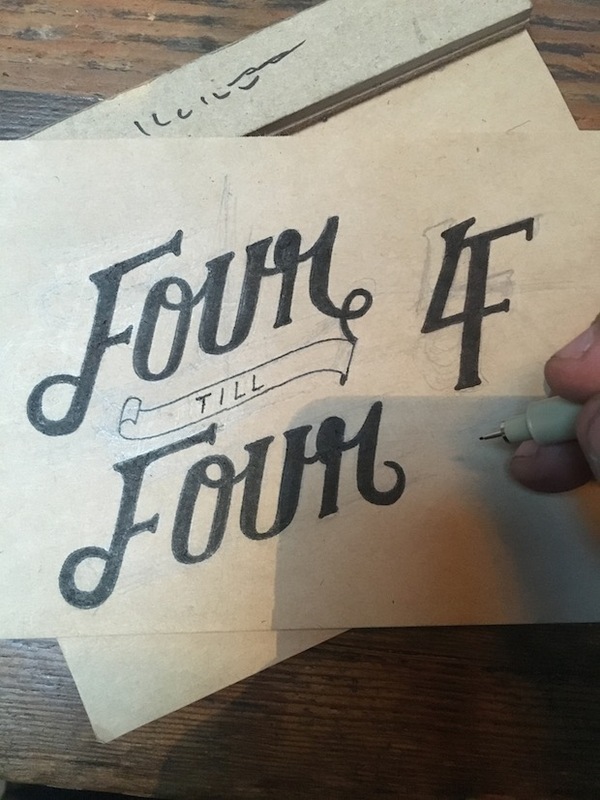 Fourtillfour branding work by Christian Watson of 1924us. Excellent article and most excellent coffee shop!! A great addition to old town Scottsdale! Good luck. Fourtillfour!! !